This big farm house sits on top of almost 6 beautiful acres comprised of mature woods and meadows, with an additional 21 available. Most of the home has been renovated a few years ago. 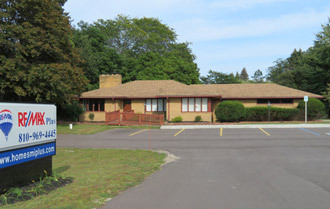 The outside and many of the rooms are recently painted. This home has 2 full baths one upstairs and the other one on the main level includes the laundry room. This big home has 5 bedrooms, 3 upstairs, and 2 on the main floor. Huge dining room or can be used as a sun room. Ceiling fans in almost all the rooms. MI basement has an outside entrance and also from inside. There is a 1 and a half car garage up near the front and a big barn (barn needs work and is unsafe.) The property has many trees and some open areas. Plenty of wildlife through out the property. Come add your lovely touches to this big home and beautiful property and make it your estate.